Listen to sounds through solids. They sound quite different from the same sound coming through the air. Different materials and shapes transmit sounds differently. Various household objects made of metal, plastic and wood. Vary the length and the size and the shape. Simple shapes are better that are made out of one piece. e.g. 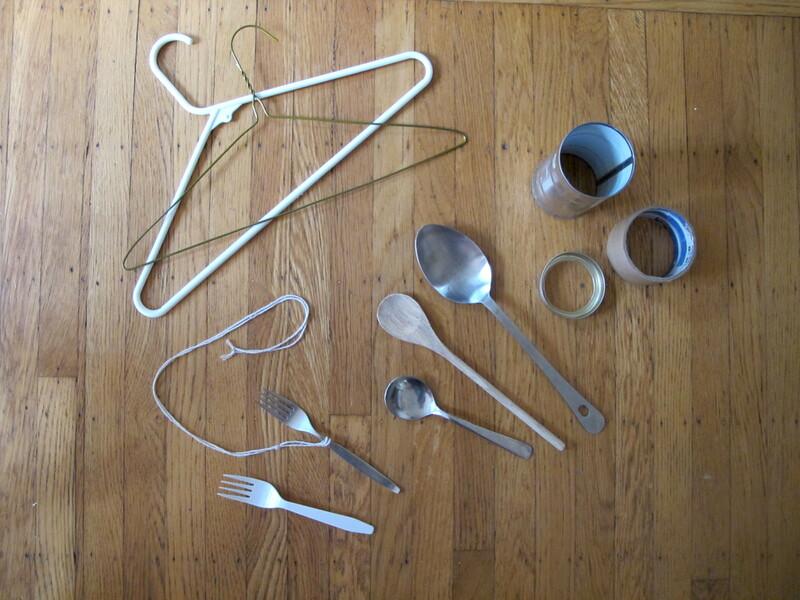 metal cutlery, wooden spoon and cooking implements, coat hangers (wire and plastic), key, chopsticks. 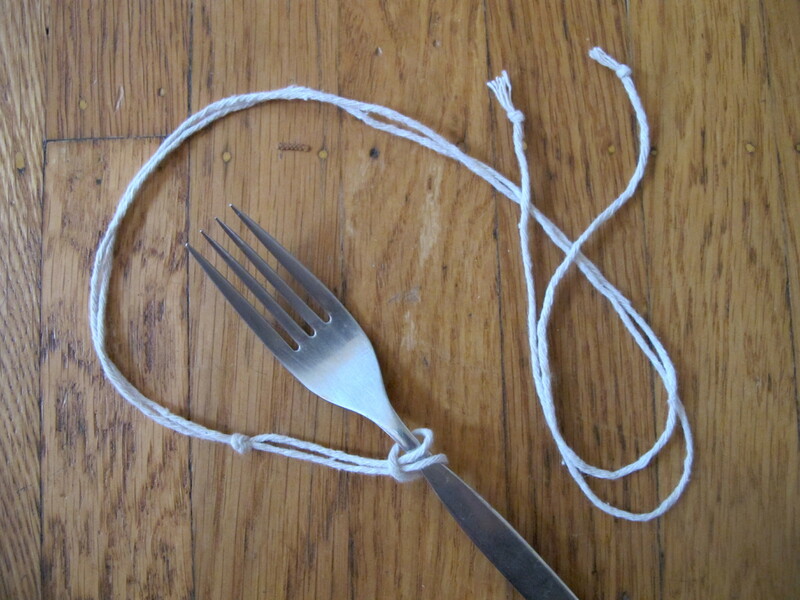 Secure the string to the object so that it can hang freely (thread the ends around the object and through the string loop to secure - see close up image). 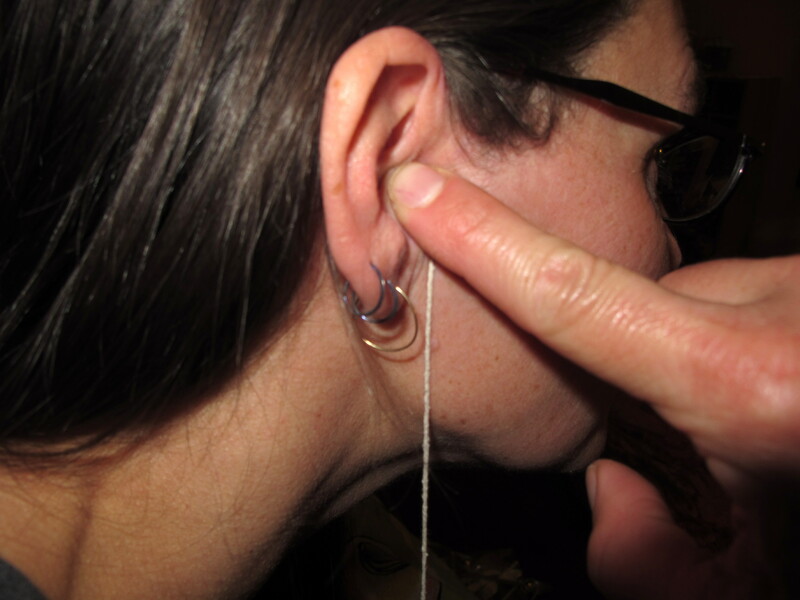 Hold the two lengths of free string, and push them onto the flap of skin that covers your ear canal, so that your ear is blocked and the string is against it. This will mean that you only hear sounds coming up the string, and not through the air. Hang your head over so that the object dangles freely on the strings. Swing the object so that it bangs against a table or chair, to start it vibrating. 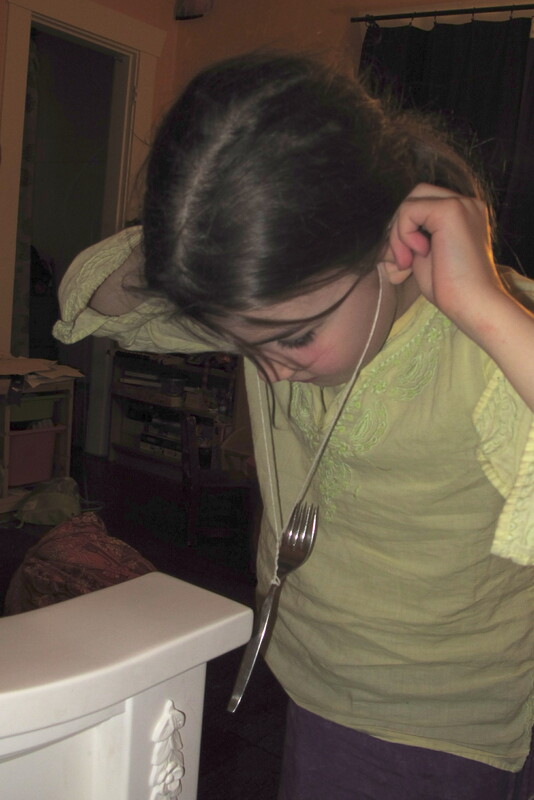 Listen for a sound - it may be a ring, a knock or very little sound at all, depending on the object. Ask students to note what they hear with the different objects (worksheet attached below). Did all materials make a sound? If not, what were those objects made of, or what was their shape? Try making the ringing sound, then touching the object or string to stop the ring. As you bang the object it vibrates. The vibrations travel up the string to the bones in your ear, where you hear them as a sound that has passed only through solids. Different materials have different molecules that transmit the vibrations to different extents, and differently-shaped objects vibrate with different frequencies. Just as the sound is quite different through the string, compared to through the air, animals that hear sounds through water or the ground hear sounds quite differently from us. Also try laying your ear flat on a desk, and knocking on the other end of it with your knuckles to hear sound through a solid. Students can wrap the string around their fingers first, then put their finger on their ear flap, to avoid the string going on the ear flap directly. Or push the string against the bone of the temple. Hard for grade Ks and 1s to manipulate the string loop.